DEARBORN COUNTY, Ind. -- More than 40 cars were involved in a massive pileup on WB I-74 near the Indiana-Ohio state line, Indiana State Highway Patrol confirmed. The crash began with one jackknifed semi-truck and quickly escalated due to snow squall, patrolmen said. The crash resulted in some serious injuries and shut down I-74 in both directions Tuesday morning. The crash took place on WB I-74 near the Indiana state line and weigh scales, Dearborn County deputies said. 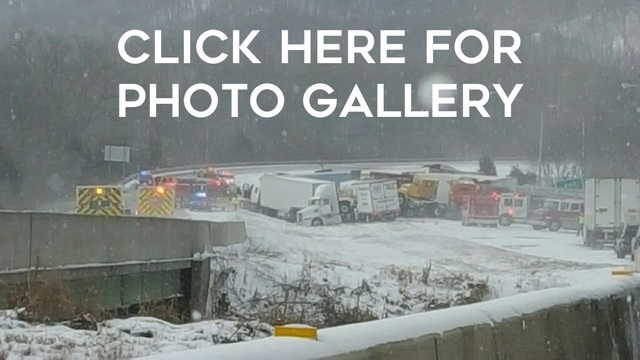 The interstate was shut down in both directions near mile marker 168 at 11 a.m. Tuesday. The pileup was a combination of two crashes, patrolmen said, beginning with 28 vehicles and ending with a total of 40. Drivers involved in the crash were bussed to nearby Shelton Fireworks.